Close curtains and shades during the summer to keep your home cooler. Fort Collins electric and water customers are eligible for a $50 rebate on ENERGY STAR clothes washer. Applications are available online or at a participating retail store. Here's what an ENERGY STAR® clothes washer can do for you. Your clothes will come out cleaner and with less wear. These washers don’t have agitators. Instead they tumble the clothes, while using jets of water to create the cleaning action. This avoids the pulling and tugging of an agitator. Your clothes will dry faster and save you time. The washers spin up to twice the speed of a conventional washing machine, extracting more water in the process and reducing the time in the dryer. Washing in cold water keeps your colors vibrant and is easy on your fabrics. These machines adjust the water temperature to optimize the effectiveness of modern detergents, so you get the best cleaning and your clothes get the best treatment. These washers accept large, bulky loads, so no trips to the laundromat to wash quilts. Clothes rinse cleaner, as the washer senses when the detergent is completely rinsed from your clothes. Washers operate quietly and also self-balance the load - so you never have your washer banging and walking around your laundry room. ENERGY STAR® washing machines use 25 percent less energy and 45 percent less water than an old fashioned top loader. 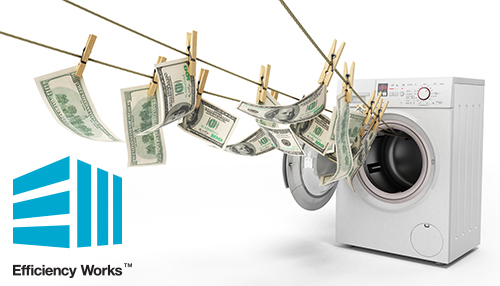 New ENERGY STAR® washing machine prices have dropped in the last few years and are now close to what a standard machine costs. If you have a 10 year old top loader, that washer is costing you close to $200 per year to operate over a new ENERGY STAR® machine. This can make up the price difference of a conventional machine in less than one year. This rebate may not be combined with other instant rebates offered by Fort Collins Utilities or Efficiency Works. Not ready for a new washer? Check out our tips to improve your laundry experience for little to no cost. Many local appliance stores will pick up old clothes washers as part of delivery charges for new machines. For information on disposal options, visit Environmental Service's recycling page.